Your cabin air filter is located behind the glove box. STEP 1. Remove the glove box by gently squeezing the right and left sides inwards. This allows the plastic stays to clear the opening. The glove box will rotate down and out-of-the-way. STEP 2. Locate the basket with two screen doors. The air filters will be installed in the tray behind the screen doors. You will most likely not see and have access to the tray, because it is hidden behind the air dam. STEP 3. To access the tray where the filters go, turn your key to the “on” position (do not start the engine) and push the re-circulate air button on the HVAC control panel. This will raise the air dam and provide access to the tray. STEP 4. Open the left screen door by pulling the door latch down and toward you. I do believe that in newer JK models you might be able to open the right screen door as well. In my 2012 I cannot open it wide enough to fit the filter through. STEP 5. Remove the old filters. Start with the left half and then move the right one over to the left and pull it out as well. STEP 6. Grab your new filters. Here’s a comparison of the old one and a fresh one. I might have waited too long, the old one was filthy. I used to buy these filters from a Jeep dealer, but apparently they do not carry the two-piece filters any more. They got replaced with a single piece filter. 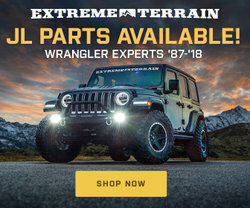 I don’t think I would be able to install a filter that comes in one piece, but if you own a newer model JK you might be able to. Luckily you can still find the two-piece filters in any car parts store. Just pick the brand that you prefer. STEP 7. The arrow on the filters should point down, toward the direction of air-flow. STEP 8. Insert both cabin air filters onto the trey behind the screen doors. STEP 9. Push the first half all the way to the right to make room for the left one. Make sure they are seated correctly and lay flat. STEP 10. Close the screen doors and make sure the latches snap back in place. STEP 11. Turn the air re-circulation off to lower the air dam. You can turn the ignition key to the “lock” position, and remove the key. Re-install the glove box. Begin by lining up the bottom hinges and again gently squeeze the right and left sides inwards, allowing the plastic stays to pop into their original position. You’re all done. 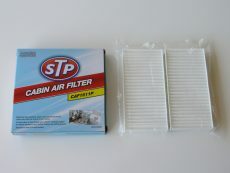 Enjoy your new cabin air filters.